Head into any menswear retailer on the high street and you will be able to find yourself a pair of decent looking cuff links. They will do the job, in that they will hold your cuffs in place and the better of the picks out there will even add some colour and style to your shirt and suit. Should you wish to up your cuff link game, you will need to go to a more dedicated provider. Step forth, Deakin & Francis. Established in 1786, the brand is England’s oldest family jeweller and until recently, much of its beautiful creations were kept behind the scenes as the firm concentrated on commissions from retailers and luxury brands. It has only been a few short years when they decided to put themselves on the map, now operating online and from bricks & mortar premises at the flagship store at Piccadilly Arcade, London, a haven for menswear aficionados. Now managed by brothers James and Henry Deakin (the seventh generation of the family to manage the business), they spent their school holidays joining their family at work, learning from the craftsmen or doing the rather more glamorous job of attending trade shows in Switzerland and London. 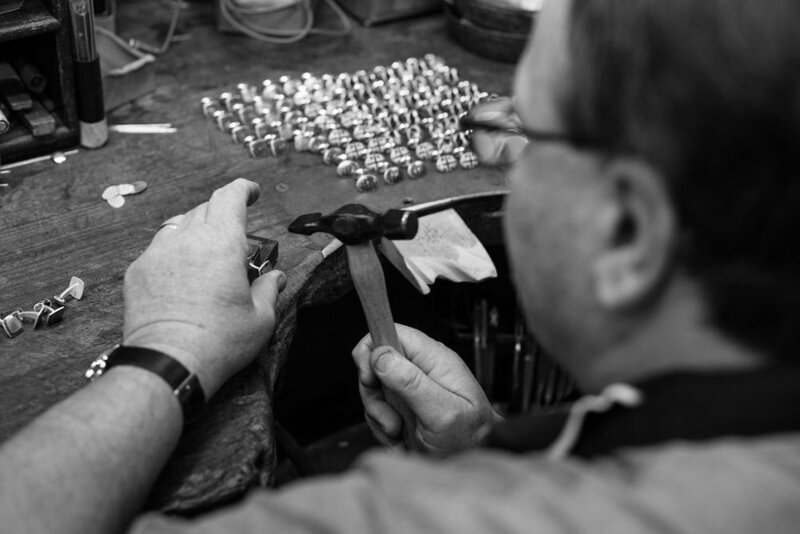 Now, both fully qualified in Gemmology, they employ a team of jewellers for different stages in the creation, manufacture and design of jewellery. And what a process that it. 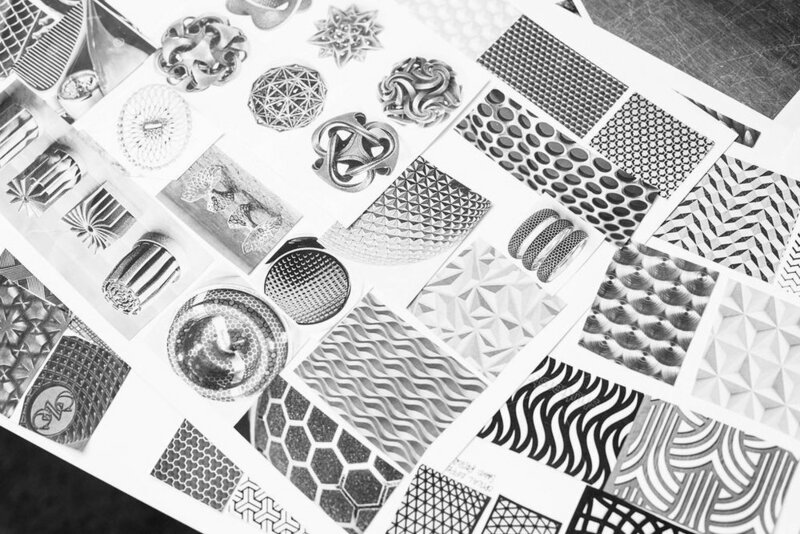 Beginning with sketches and the consideration of materials, designs are made, dyes are cast and prototypes are made. From start to finish, the whole process starts and finishes at the same location, including enamelling, design, marketing and manufacture. Whilst the current range encompasses neck pieces, rings and lapel pins, it is cuff links for men that are the brands real specialty. The Birmingham based space is full to the brim with silver and gold. Whilst the label still carries designs made as far back as 1908, newer pieces have seen cuff links set with rubies, diamonds and sapphires and a more modern and varied design range. Model makers create new designs by sketching and storyboards before creating 3D cufflinks which are then taken to the mould makers to create the mould. More traditional designs are made using dies to stamp out precious metals. 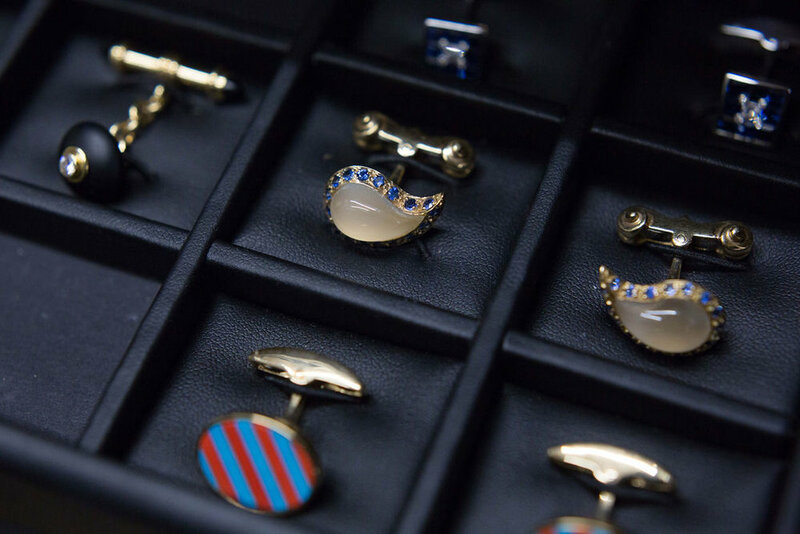 In over 200 years, there has been over 5,000 different cufflink designs including classic diamond and gold pieces and funky animals, pirates and car designs. With such a devoted approach to each product, it comes as no surprise that customers include celebrities and members of royalty worldwide. It is in the bespoke service that Deakin & Francis can provide that really sets them apart from so many other brands. Combining their heritage and access to skilled artisans as well as an unparalleled knowledge of the industry, they are the perfect place to go to for creating your own, unique pieces whether that be cufflinks with a picture of your pet, lapel pins with mini aeroplanes to exactly mimic the real deal or the resetting of your old pieces and the creation of something new and exciting. Going over and above, and having the skills and expertise to do much more than their competitors, makes Deakin & Francis really stand out. They use new materials like pure gold and silver, as opposed to recycled metals to keep impurities away. 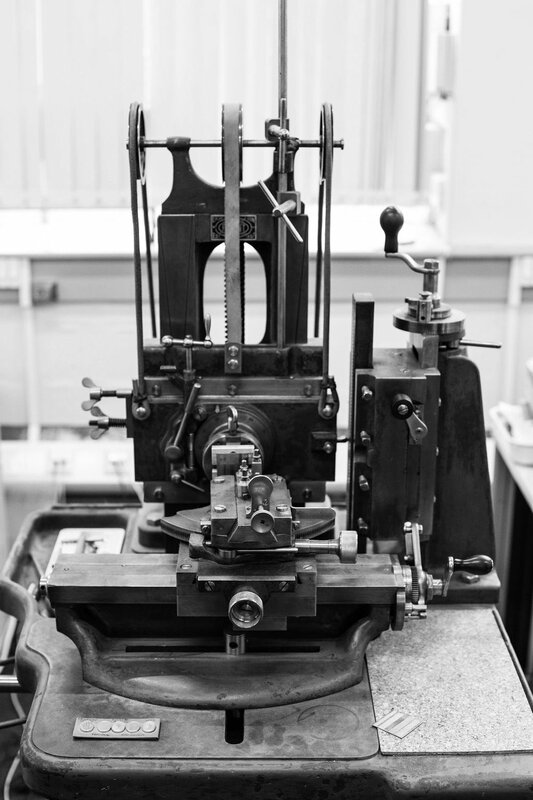 Every stage is managed by hand by workers in the 15 team Birmingham based headquarters, where machinery dates back to the early 1900s. Each piece feels and looks special and unique, with moving mechanics, precise jewels, an intelligent approach to natural resources and a forward thinking aesthetic. With that in mind, the brand is always looking to what’s next, with some of those projects including cuff links crafted from one of a kind minerals & gems, a limited edition collection of embroidered designs as well as some unpublishable, exciting collaborations.